The tour was very interesting and fascinating, seeing those wonderful and gentile creatures observing them eating is great the tour persons was very efficient and knowledgeable of where to go to see the whales. Amazing day! Never ever forget being so up close and personal with these amazing creatures!!! When I first saw all the boats in the area, I was a little annoyed thinking that it would be another commercialised non event! How wrong I was - it was amazing! Great guides brilliantly organised! Very highly recommended! First time with Viator but second time swimming with the gentle giants. Impression? 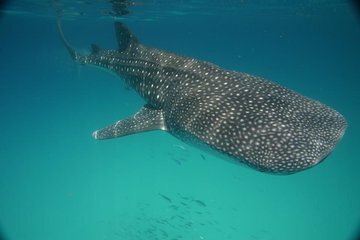 Friendly helpful crew, powerful boat, clear pre-cruise instructions and a co-operative captain who allowed adequate time to snorkel with the whale sharks. Would highly recommend this operator. A superb tour! I feel very honoured that we were able to catch up with the one whale shark in the area that day. Such an amazing experience to swim alongside such a huge yet majestic creature. The tour was well organised, the guides friendly and helpful, and the lunch provided was great! I would definitely do this tour again and highly recommend it to others. Had an awesome time, saw so many whale sharks. They are amazing creatures so graceful as they swim along, feeding. Swimming beside them was a dream come true. The tour company was very organized and helped us make the most of our adventure. I highly recommend them! I did this once before and also on trip advisor. It was Excellent. Thank You... You are The Best !!! I enjoyed this tour very much...a few things to point out...take the sea sick pill! I have never been sea sick before but I got sick. Also wear a life vest the first time and no snorkel, it's hard to swim and breath through a snorkel when you're trying to catch up to the Whaleshark. I only went once, but my friends said it was so much better that way. Renato and JJ were great! we enjoyed saviche and a Beer while in the water at Isla Mujeres, nice way to end the tour. Swimming with whale sharks was definitely one of the coolest things our family has ever done. I would definitely recommend it EVEN if you are very scared or unsure--I was nervous about jumping into the open ocean, but you get a life jacket or a wetsuit and snorkel gear, and there is no danger with the animals. The ride out to the feeding areas and then trying to find the whale sharks took a bit longer than expected, but it was well worth it once we got to jump in. The captain and guide, Fernando and Rodrigo, were extremely nice and helpful! The food fresh guacamole and shrimp ceviche was amazing as well. If you're lucky you might stop at Isla Mujeres for a little while too. Would recommend!